Inspirada Las Vegas unveils four model homes by Toll Brothers within the Henderson, NV master plan in the south Las Vegas Valley. The community now has 14 new townhome, condo and single family home models. 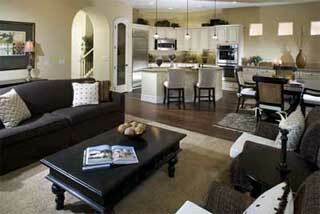 Within Inspirada real estate Toll Brothers has 20 floor plans in five home collections. Some of the dramatic architectural elements include foyers, large master baths, family rooms, dining areas and amenity rich kitchens. Inspirada Las Vegas master plan will hold Toll Brother’s grand opening June 30 for the single family homes Coronado, Barcelona and Balboa home collections, four Castellos mansion-condominiums and three Casa Citta townhomes. Ten on-site new model homes in Inspirada real estate are now under construction at the new master-planned community in the southern portion of the Las Vegas Valley in Henderson, Nevada.